I spent the last few days in New Orleans with my forum / mastermind group, which I have written about before in several FFfT’s. During these meetings we spend time discussing our professional and personal lives. We laugh, we cry, we reflect, we nurture; at the end of the 3-4 day meeting we all come out better, or at least I do. I am humbled by the generosity, wisdom and time they give. 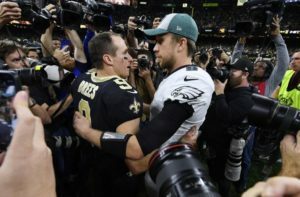 During this visit I was fortunate enough to attend the playoff game between the Eagles and Saints. How could I not go? However, the outcome was not what I had hoped for; the Eagles lost. It was a tough game, but a good game nonetheless. Prior to the game we attended a tailgate hosted by “Sparky”, he has won awards for his tailgates in NOLA by a few organizations. The tailgate was amazing, we got to eat and drink as well as meet iconic characters that are staples at Saints games. All that aside, what really struck me was the graciousness of the Saints fans. I was wearing an Eagles pendent and once it was noticed it was “on”. We threw insults at each other and told each other how badly the other team was going to lose; it was all in fun. One Saints fan told me how badly they were going to beat Eagles and afterwards he would be happy to buy me a drink to drown my sorrows. He followed it up with the promise that if the Saints lose he would still buy me a drink for a well-played game. What shocked me was that was not the only example of such acts of generosity. In the stadium, surrounded by Saints fans, believe it or not, I got high fives when my team scored. Of course they were not as enthusiastic, but the graciousness of the act was amazing. The Saints fans and the folks of the City of New Orleans have truly embraced the concept of ichi-go ichi-e, even though they may have never heard of it. Between the people of New Orleans and my forum, I was truly touched by everyone on this trip.